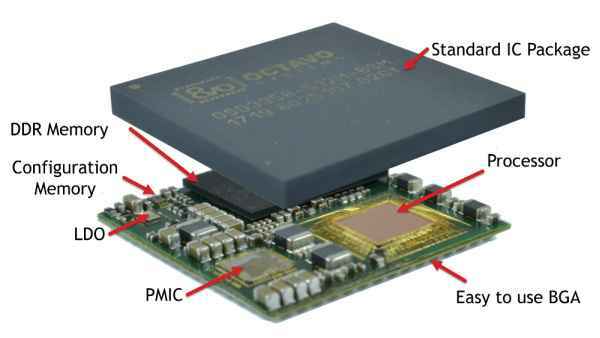 The OSD335x C-SiP System-in-Package (SiP) developed by Octavo, is a concept package that is modeled on its previous Sitara AM335x based SiP by including up to 16GB eMMC, an oscillator along with 1GB DDR3, PMIC, LDO, and EEPROM. The OSD335x C-SiP, is the most consolidated System-In-Package (SiP) module ever made. Modeled like its predecessors, the OSD335x C-SiP incorporates the Cortex-A8 based Texas Instruments Sitara AM3358 SoC with RAM, including the addition of the eMMC and oscillator for the first time and other principal components. The addition of the eMMC and the Oscillator to the processor, RAM and power supplies makes the OSD335x C-SiP a complete system. The CTO of Octavo Systems Gene Frantz said it has everything one needs for a powerful Linux computer integrated into a small, easy to use package and what is only requires to do is add power and a couple of resistors. That is why it is called a Complete System-In-Package. The advantage of SiPs is that they require less space and someone can achieve easier and speedy development, among other benefits. During an interview with LinuxGizmos, Octavo Systems CTO said they have done most part, by taking on the tedious part of system design for the embedded developers (how to get the processor, memory, PMIC, and other components to work together nicely). With the incorporation of OSD335x C-SiP, many of the monotonous and tedious tasks related to designing a computing system are eliminated. Tasks like laying out DDR3 memory interfaces and power sequencing are no longer needed. Also, any issue about Electromagnetic Interference (EMI) caused by the layout of the Oscillator is removed. Apart from making a simple design of an embedded system, the OSD335x C-SiP is also about 50% smaller than a corresponding system built with separate components. This allows designers to decrease their design size, save cost on their PCBs, or add processing power to form factors that weren’t possible before. Like the earlier packages, the OSD335x C-SiP offers a TPS65217C PMIC and TL5209 LDO, both from TI. It will also be available in 0 to 85°C and -40 to 85°C models.